One of my favorite ways to pass the time is to reflect on the choices and events of my life that have lead me to this point. It is fascinating that so many specific choices had to come into play for me to end up right here, right now. The reason I do this is always because I love finding the pattern of what the underlying core principle is that drives me to do what I do everyday. We all have core principles, what it is that we think is most important in that moment, the thing that makes us choose one thing over another. After so many years of reflecting, I have really good evidence that there is definitely a pattern in my choices. There is a common theme to my career and that is that I am always taking any opportunity I can find that allows me to step into another person’s world and solve their problem. This is why I was an amazing waitress in high school, why I excelled at being an administrative assistant and executive assistant, and why I am a successful salesforce.com administrator. I see these roles as vehicles that allow me to solve problems for people in a big way! 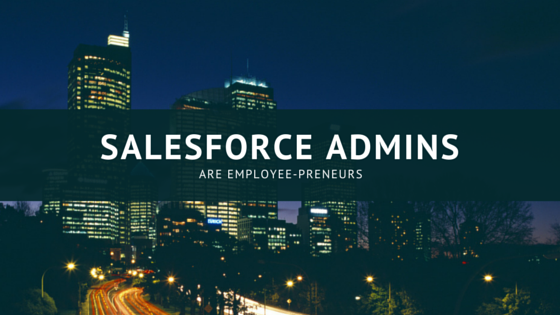 I propose Salesforce Administrators are employee-preneurs in their organization. We solve problems for our stakeholders (our customers) just like businesses solve problems for their customers! We must bring value to our company through our implementations, we must train (sell) our internal customers (stakeholders/users) so they understand the efficiencies and value of salesforce, and we must be the salesforce advocate (marketing). We have to dream big and find a way that is within our control to reach those dreams for our company! We must have a vision of what the end goal is with our projects and then work to build a successful product that strives within the organization. We figure out the vision by working with our stakeholders to understand what their current business and strategic goals are. Then we find the quick wins that solves a piece of the problem and keep building momentum off of these projects until we have a true roadmap. Need to get better insight into the business development pipeline? Just implementing Opportunities alone will not magically fix this problem, but making sure ONE KPI (Key Performance Indicator) is consistently measurable by using automated field updates or mandatory fields is a quick win that builds buy-in and value. Once they see how awesome it is to have this ONE KPI measured reliably they will be begging you to give them the rest of the KPIs. Show them the value through quick wins and build on them. “A Force.com Light App has up to 10 custom objects and 10 custom tabs, has read-only access to accounts and contacts, and supports object-level and field-level security. A Force.com Light App can’t use the Bulk API orStreaming API. There are many ways to find quick wins but it all starts with talking to your leadership teams and understanding their pain. Then you can take the opportunity to be the hero by solving their problems! 1. Ask. Schedule time with the managers of your organization and just ask them what their biggest problem is right now. They will tell you! Ask them what the perfect end result would be if you could snap your fingers and give it to them (i.e. is it a specific report view, is it a reduction in email churn, is it insight into data that only lives in Excel right now and is unreliable and taking too much time to figure out?). 2. Commit. Once you figure out which item you can move forward with as a quick win tell them your plan to solve their problem. You don’t have to tell them right then you can take good notes and tell them you will think about ways you might be able to help and get back to them if you think of anything. 3. Follow through. Telling them your initial plan does not mean you will actually do it or have the time right now, etc. So figure out how long you think it will take and what your idea is and communicate it to them to get approval from whoever you need approval from. Then deliver on the promise. See my other posts about project management and deliverables (and remember to mind your PB&Js)! Now the fun starts! It is easy to take step #1 today! Just schedule the meetings now so they are officially on your calendar. If you want to meet with many people before committing to step #2 that is a really good game plan. Figure out if many managers have the same pattern of problems.. and then the correct path will be clear (you will solve one problem for many people – WOW!). Salesforce admins that operate as mini-entrepreneurs within their organization consistently define the dreams of other people and make them come true (or as close as possible). As admins we have a built in machine called force.com at our finger tips and we leverage this practical skill as a means to realize their dreams… and in turn our dreams come true (through gained efficiencies and providing value by implementing really fun projects!!). Find me on the Admin to Admin Academy at success.salesforce.com today! I look forward to hearing your success stories! !